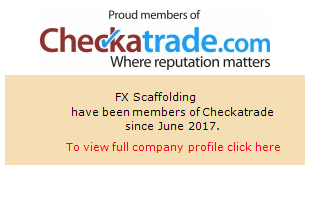 FX Scaffolding is dedicated to operating to the highest standards of professionalism in scaffolding rental services for Commercial projects in Essex and the London Metropolitan area. We work with you as a supplier partner, learning your needs and budget and providing our skills and expertise in return. We can handle any type of commercial scaffolding project no matter how small or large - with top quality materials, two decades of knowledge and a team of skilled scaffolders all waiting to make your commercial project a success. For examples of our completed work, see our Commercial Project Gallery. Planning and design are crucial elements when it comes to the use and implementation of any scaffolding rental solution in Essex. Outlined below are the stages of our services. Our services begin with a site visit where we will discuss all your requirements and offer suggestions using our expert knowledge in the field. In addition to this, we will carry out a full risk assessment on-site. After our visit we will then put together a detailed and bespoke quotation; which we aim to have back to you within 48 hours. Once you are happy with the scaffolding design, price of our services and have decided that you would like to proceed - we will then erect the scaffold structure. We monitor all of our scaffolding once erected in order to assure a safe working environment, and offer a quick response call out service if you or your team identify any issues. When your scaffolding rental requirements have finished, we ensure the dismantling of the scaffold structure is handled with the same level of care taken to erect it. The purpose of which is to minimise the health and safety risks for the public as well as the Scaffolders' themselves.